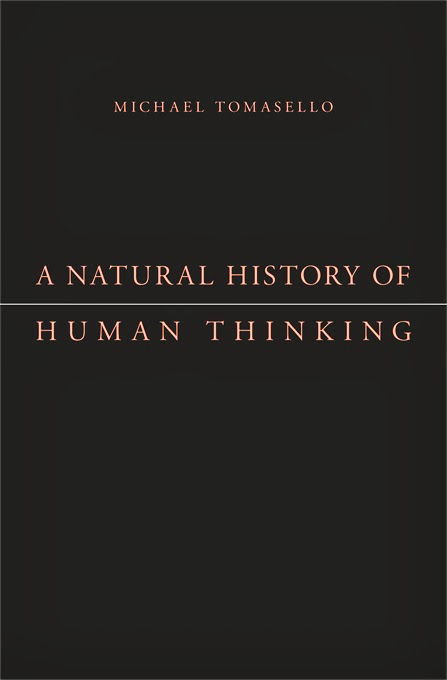 The recently published book by Michael Tomasello (A Natural History of Human Thinking. Harvard University Press. 2014) provides support for my contention that ecological challenges, among them finding and capturing food, are key to understanding the functioning of our current minds. Based on his 20 years of comparative studies of great apes and human infants and children, Tomasello develops a compelling argument that the evolution of our unique language and complex ways of thinking was driven by the fact that our ancestors had mutually shared goals that could be achieved only if individuals cooperated, rather than competed with, one another. He argues that the critical first step in the long and complex pathway to modern human cognition was the development of collaborative foraging, that is the pursuit of prey that could not be captured by solitary hunters. “In this book we attempt to reconstruct the evolutionary origins of this uniquely human object-reflective-normative thinking. The shared intentionality hypothesis is that what created this unique type of thinking – its process of representation, inference, and self-monitoring – were adaptations for dealing with problems of social coordination, specifically problems presented by individuals’ attempts to collaborate and communicate with others (to co-operate with others). Although humans’ great ape ancestors were social beings, they lived mostly individualistic and competitive lives, and so their thinking was geared toward achieving individual goals. But early humans were at some point forced by ecological circumstances into more cooperative lifeways, and so their thinking became more directed toward figuring out ways to coordinate with others to achieve joint goals or even collective group goals. And this changed everything. “There were two key evolutionary steps The first step, reflecting the focus of social infrastructure theorists such as Mead and Wittgenstein, involved the creation of a novel type of small-scale collaboration in human foraging. Participants in this collaborative foraging created socially shared joint goals and joint attention (common ground), which created the possibility of individual roles and perspectives within that ad hoc shared world of “form of life.” . . . . . . There is considerable evidence that increased incorporation of meat in the diet of our ancestors began with scavenging, but we do not need to agree on the details to recognize the importance of needing to cooperate to achieve foraging success as a driver of more complex cognitive abilities among our ancestors. Amen! Our brains are organized to help us make better decisions. The proof of the pudding always lies in actions. In the final chapter of my book I argue that the prevalence of polar typology in human speech evolved because action is fundamentally polar. Building on the ideas of Bermudez (2003) Tomasello (page 19) offers another reason, one that is compatible with my view, for the prevalence of polar topology in human thinking. “Negation is a very complex cognitive operation, and one could easily object to the use of negation in these proposed accounts of great ape logical inferences. But Bermudez (2003) makes a novel theoretical proposal about some possible evolutionary precursors to formal negation that makes these accounts more plausible. The proposal is to think of a kind of protonegation as simply comprising exclusionary opposites on a scale (contraries), such as presence-absence, noise-silence, safety-danger, success-failure, and available-not available. If we assume that great apes understand polar opposites such as these as indeed mutually exclusive – for example, if something is absent, it cannot be present, or if it makes noise it cannot be silent – then this could be a much simpler basis for the negation operation All of the current descriptions assume prolongation of this type. To develop his multi-step hypothesis for the evolution of modern human thinking, Tomasello delves deeply into the communicative challenges imposed by coordinated group activities. In my book I focus on challenges imposed by the physical and biological (that is, all species other than humans) environment. I do point out that when we compete for mates and social status we tend to emphasize things that have valence because they were highly relevant to the major decisions our ancestors had to make, but I pay little attention the social components of our current ecological minds. Thus, while offering compelling support for some of my arguments, Tomasello’s exciting book is a source of evolutionarily based hypotheses that enriches our understanding of how we came to be the remarkable species we are today.